Regional Information Center "CARPATHIANS" » ILNYTSKE OUTCROP OF BROWN COAL (LIGNITE). 48° 19′ 37″ N lat; 23′ 05′ 20″ E long. In the north-eastern outskirt of Ilnytsya township there is located Ilnytske lignite deposit and quarry up to 10 m deep. 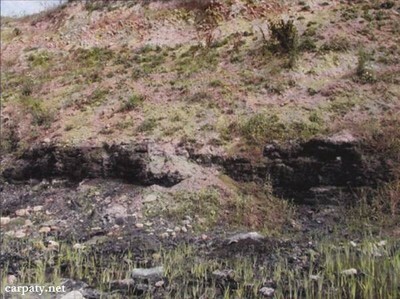 Below Early Quaternary clay-gravel sediments of 5-7 m thick in the quarry is discovered Pliocene brown coal (weakly-coaliferous lignite) layer up to 2 m thick. 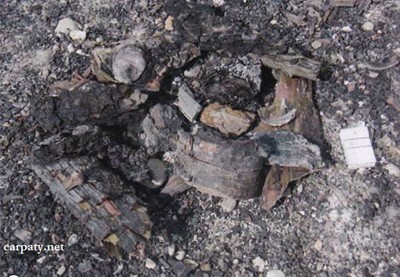 In the coal beds there are preserved fragments of the tree crust (birch) and their trunks. Sometimes there occur findings of softwood cones. Dropped dried trees, branches and their fragments were displaced from surrounding volcanic ridges by rivers and streams into the Irshava basin. They were accumulated in the basin then had been overlapped by terrigenous sediments and transformed into lignite, Ilnytske artificial lignite outcrop is largest in Trans-Carpathian. It characterizes post-volcanic stage of the Trans-Carpathian trough development. Accessible by motor-car. 500 m to the south from Ilnystya-Bilky road.